Jerusalem city councilmen call on police not to block Jerusalem Day 'rikudgalim' event from parts of Old City. A number of leftwing NGOs including Ir Amim and Tag Meir have called upon Israeli police this week to bar the annual Jerusalem Day “Rikudgalim” march from parts of the Old City. The effort to prevent the march from passing through the Muslim Quarter of the Old City gained momentum this week when the “Yerushalmim” faction within the city council endorsed the proposed ban. Vice Mayor Dov Kalmanovich and city board member Moshe Lion have wrote letters to Jerusalem District police and the mayor’s office, imploring them not to interfere with the annual celebration. 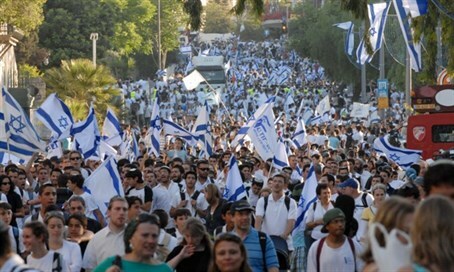 Lion argued that changing the march’s route would constitute a reward for those who wish to undermine Jewish sovereignty in Jerusalem. In his letter to Jerusalem Mayor Nir Barkat, Vice Mayor Kalmanovich also suggested that altering the march route constituted a victory for Israel’s enemies. Kalmanovich suggested that the proposal by the Yerushalmim faction to alter the march route was part of a larger plan to achieve a de facto partition of the city.